Creating an entire world from scratch can be an exhilarating and terrifying experience—because you control everything and everyone. Readers want to be swept away into a new world and yet there needs to be something familiar with which to connect. This course talks through a range of techniques that will show you how it is possible to craft an entire world from even the smallest of details. It will also make you dig deep into the reasons for your choices, unconscious or otherwise, to make sure you have a strong foundation. 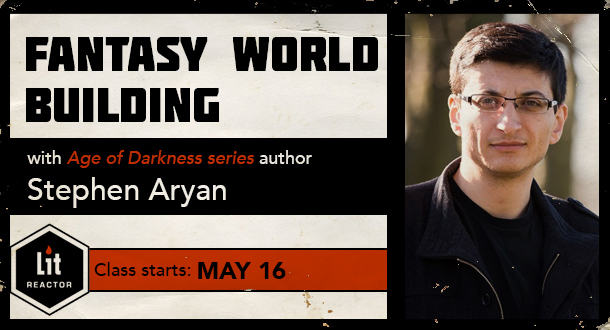 In two weeks, Stephen Aryan delivers a guide to fantasy world building so that everything in your story feels genuine and the world is immersive for readers. The goal in both lectures is to provide you with a range of tools to help you build something unique, but also to challenge the way you currently think about world building. Whether you have something in mind already Stephen can help you to flesh it out or build it up from even the seed of an idea. By the end of the course you will be able to create a realistic and rich world that readers can really sink their teeth into. Stephen Aryan is the award-winning author of epic fantasy. His first trilogy, Age of Darkness, comprises Battlemage, Bloodmage and Chaosmage and was quickly followed by his second trilogy, Age of Dread, which wraps up this summer with Magebane. Learn how to build a world that feels as if it has existed for a long time. A place that is rich with history and culture that draws the reader in. We will be talking about the land itself and how it influences more than you might realize. Assignment: Write a short piece about a character making a journey across one part of your fantasy world exposing the reader to some of its remarkable features. Creating an interesting world is only half the battle. Readers need to believe that the people they meet, your main characters and all of the others they encounter, are fully rounded individuals. We’ll be talking about how to build characters and give them depth but also how they influence the world around them and can even be the starting point for a story. Assignment: This is where we put everything we’ve learned so far to the test. Write a short vignette that captures the essence of a brand new character in a new setting. Stephen Aryan was born in 1977 and was raised by the sea in northeast England. A keen podcaster, lapsed gamer and budding archer, when not extolling the virtues of Babylon 5, he can be found drinking real ale and reading comics.